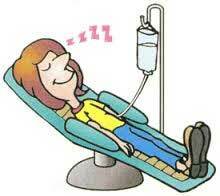 IV sedation is a type of anesthesia we use to help you sleep, relax, and not remember the procedure. As an oral maxillofacial surgeon, we have extensive training in general anesthesia, deep conscious sedation,(IV sedation), and advanced cardiac life support. We do a detailed health history and consider your medications to ensure that the sedation is safe and there are no drug interactions. You as a patient, are monitored with blood pressure, heart rate, oxygen saturation, EKG, and carbon dioxide monitoring equipment throughout your surgery. The surgical assistants are all certified by a national dental anesthesia assistant program and have training in basic life support. I am a Fellow of the American Society of Dental Anesthesiology as well as certified by the National Board of Dental Anesthesiology. All of this ensures that you have a very safe and comfortable sedation experience.